Whether you have a cozy little cubicle or have snagged some prime real estate with that corner office, chances are that you are working at a desk. And let’s be honest, they’re never large enough. You end up with stacks of loose paper, deadlines written on your hand, and no space for that morning latte. If this sounds like you, there is a solution! All you have to do is get some tools that will help you out. But staying organized doesn’t mean using what comes with the cubicle. That’s right, you can jazz it all up by selecting items that are functional, and equally stylish. Workin’ 9 to 5 has never looked so good! 1. [P]lanner: Agendas are great, especially when you need to check dates and pencil in appointments on the go. But when you’re at work, what’s the point of leafing through to see what’s ahead for the week? The best option is to have a pad-like planner that has the months or days laid out. That way, you clearly know what’s coming and can easily glance at it for reference. 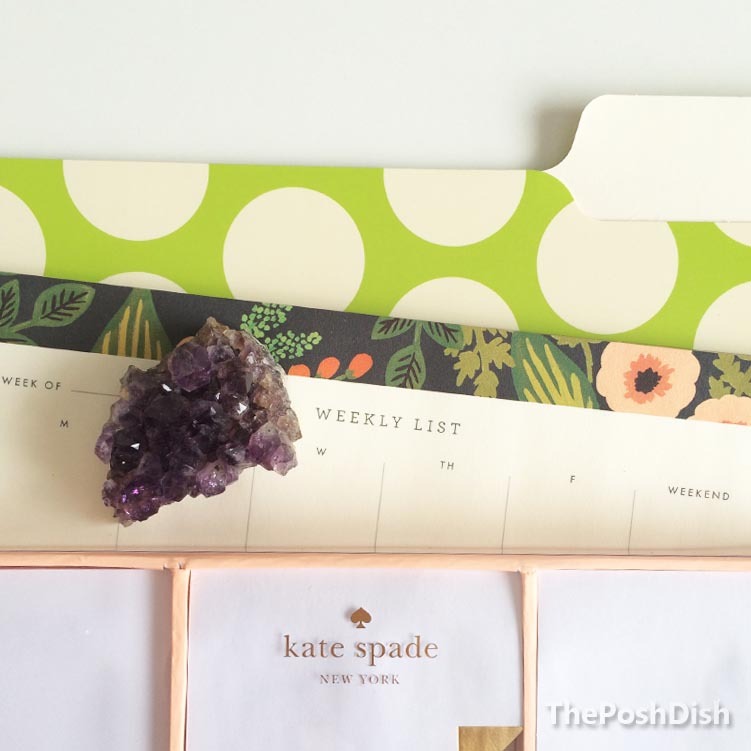 Anthropologie has a few fun options, including this Botanical Weekday Desk Calendar. 2. [P]ost-Its: Sticky notes are so versatile, they can be used to mark an important page or remind you of things that may otherwise be overlooked. To be even bolder, opt for ones that are out of the ordinary –you don’t have to stick to the traditional yellow paper. See what Kate Spade has in store, like the Deco Dot set. 3. [P]aper Weight: Keep those papers and documents neatly stacked and stop them from flying everywhere with a paper weight. Sure, you can choose the classic half-sphere but why not try a natural crystal? It not only looks stunning as it captures the light, but is also said to provide good energy (perfect for when you’re rushing to meet those deadlines). If you’re in the Toronto area, stop by Geologic and see what they have in store! 4. [P]atterned Folders: Another way to keep loose papers in one place is with folders.They have a tab to keep things clearly labeled and categorized, and make it easy to find the files you need. But the ones that you’ll find at work are blank, boring, and lack personality. Opt for folders that have a bold print instead, like this great 12-pack from Target. 5. [P]en Pouch: Though pencil holders do their job fairly well, they’re bulky and can be knocked over as you hurry out to grab lunch. To avoid all the hassle, store your writing instruments in a pen pouch. This keeps your most prized pens, pencils, highlighters, and markers in one place. And when the work day is done, you can zip the pouch and take it with you so there’s never a need to part ways! Take a look at this glitzy polka-dotted one from Indigo. How do you keep your work area organized? Leave your thoughts in the comment section or Tweet @ThePoshDish.